Kilchberg, July 24, 2018 – Lindt & Sprüngli has had a successful start to the financial year 2018. The Group achieved strong group sales of +7.7% in the first half-year, generating consolidated sales of CHF 1.67 billion. Organic growth increased to +5.1%. The Group is therefore on track to achieve its strategic target of organic sales growth of around +5% for the full financial year. Market share gains were particularly impressive in the large markets in Europe, considering the highly saturated chocolate markets and an exceptionally challenging trading environment. A vibrant seasonal business, the launch of product innovations and the good performance of own chocolate boutiques and cafés are building the base for this success. The “Europe” segment generated sales of CHF 855.6 million, which represents an organic growth of +5.0%. Germany and Italy reported sound results, while sales growth in the UK, Austria, Spain, and the “Nordics” was well above average. Growth rates even hit the high double-digits in the Eastern European markets of Russia, the Czech Republic, Slovakia, and Hungary. Key growth drivers in this segment were the core product lines Lindor and Excellence as well as limited editions of the famous Gold Bunny at Easter. In addition, a sugar-free product line from Italy attracted attention. Despite a challenging trading environment, the “NAFTA” segment was able to report solid organic growth of +4.0% in the first half of 2018, with total sales amounting to CHF 564.1 million. A highlight in this segment was the excellent results achieved by Lindt in Canada and Lindt USA. After a challenging previous period in a stagnating market, Lindt achieved good growth during the reporting period, mainly thanks to more eye-catching point-of-sale displays for the leading brands Lindor and Excellence. Ghirardelli’s sales also grew faster than the overall market. Russell Stover posted good sales with an innovative sugar-free chocolate range launched in the second half of 2017 containing Stevia, a natural plant extract. Overall, Russell Stover managed to stabilize its sales, with only a modest dip in the first half of 2018. In addition, the integration of the US companies in terms of sales, logistics and administration is progressing according to plan. As No. 1 in the premium segment and No. 3 in the US chocolate market as a whole, Lindt & Sprüngli has an almost unbroken record of consistent sales and volume growth in recent years. To support Lindt & Sprüngli’s expansion plan in North America, around CHF 200 million will be invested in the construction of new high-tech production lines for cocoa and chocolate mass within the next 3 to 4 years in the US-plant in Stratham. The “Rest of the World” segment once again reported impressive organic sales growth of +8.4%, amounting to CHF 248.5 million, which underlines the growing importance of these markets for the Lindt & Sprüngli Group. Sales in China doubled, but are still at a modest level. Growth rates in Brazil, Japan, and South Africa were once again in the high double-digits. Growth and distribution strategies specifically tailored to local consumer preferences are starting to pay off. The global distributor business also reported a dynamic sales performance. The improvement in markets for our most important raw material, cocoa beans, was only temporary. Although prices briefly dipped to a multi-year low around the turn of the year, they have since rebounded sharply. Prices for cocoa butter have also risen significantly since 2017 and are still high – currently at a 10-year peak (apart from a short interruption). Prices eased slightly for other key ingredients such as hazelnuts and sugar. A successful sourcing strategy for raw materials and additional efficiency improvements helped to reduce material and personnel costs as a percentage of sales. The Group’s average headcount increased from 12͵784 in the previous year to 13͵168 in the first half of 2018. At the same time, investments in the brands were made. This led to an improvement in operating profit (EBIT) to CHF 117.1 million as of June 30, 2018, an increase of +11.5%. Net profit improved by 12.7% year-on-year to CHF 86.0 million. Operational cash flow amounted to CHF 333.7 million. 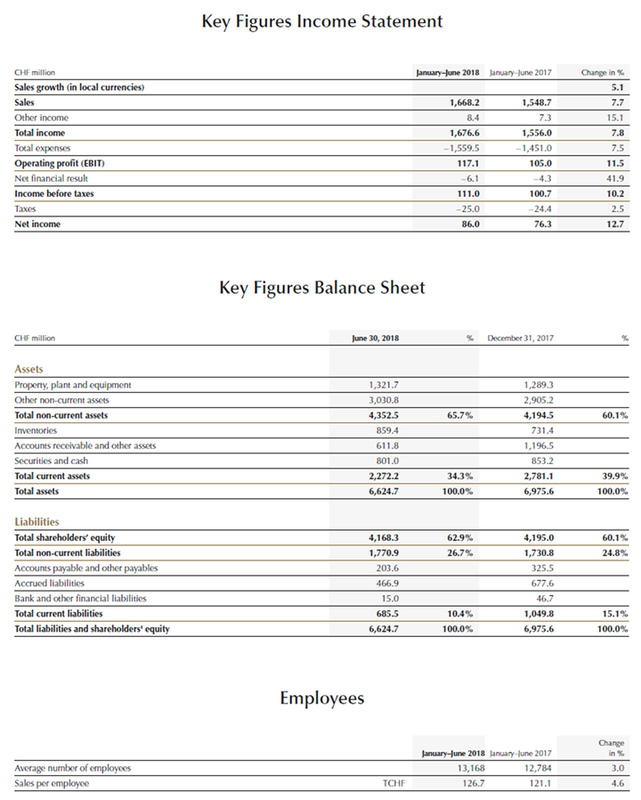 Total assets as at June 30, 2018, amounted to CHF 6.6 billion and the already solid equity ratio further increased to 62.9% (December 31, 2017: 60.1%). In March 2018, Lindt & Sprüngli started a buyback program for its registered shares and participation certificates worth up to CHF 500 million, running till the end of July 2019. The buyback program is proceeding as planned. On June 30, 2018 shares and participation certificates worth CHF 104.4 million had already been repurchased, equivalent to 0.7% of the total share capital. The continuing successful expansion of the Lindt & Sprüngli Farming Program is showing a positive impact: in 2017 over 60,000 farmers already benefited from Lindt & Sprüngli’s own sustainable sourcing model, and 79% of the sourced cocoa beans were traceable and externally verified. After initial success in Ghana, Ecuador, Madagascar, and Papua New Guinea, the Program was expanded to the Dominican Republic in the first half of 2018. As a result, all the countries Lindt & Sprüngli sources cocoa beans from are covered by the Program. Lindt & Sprüngli is therefore well on track to achieve its declared goal of having a 100% traceable and verified supply chain for cocoa beans by 2020. Important elements of the Program are a farmer premium for every ton of cocoa beans they supply, as well as professional training in business skills, good farming practices, and socially and environmentally responsible cultivation methods in order to increase crop yields and consequently family income. On top of that, improvements in the local infrastructure, such as the water supply, support the development of village communities. In short, the Program allows the continuous improvement of a sustainable supply chain while at the same time guaranteeing the high quality of cocoa beans that Lindt & Sprüngli demands. More details will be available when the full-year results are published at 7:00 a.m. on Tuesday, March 5, 2019.